A successful merchant, spinner and manufacturer. A noted art connoisseur, a visit to his house was described as "in many respects a liberal education in the fine arts." Unsuccessful investments unfortunately led to the sale of many of his paintings. Shrubland Road, Shoreditch, Tower Hamlets, London, c.1851. 13 Westfield Place, Dundee, c.1853-1865. Elmslea, Perth Road, Dundee, c.1867-1885. Tayview House, East Newport, Fife, c.1885-1889. 7 Linden Avenue, East Newport, Fife, c.1890-1902. President, Dundee Horticultural Society, 1865-1866. 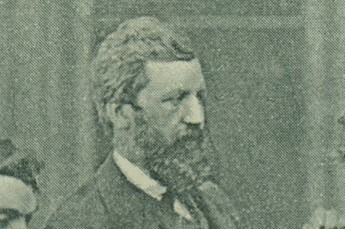 Director, Dundee Industrial Schools Society, 1867-1881. 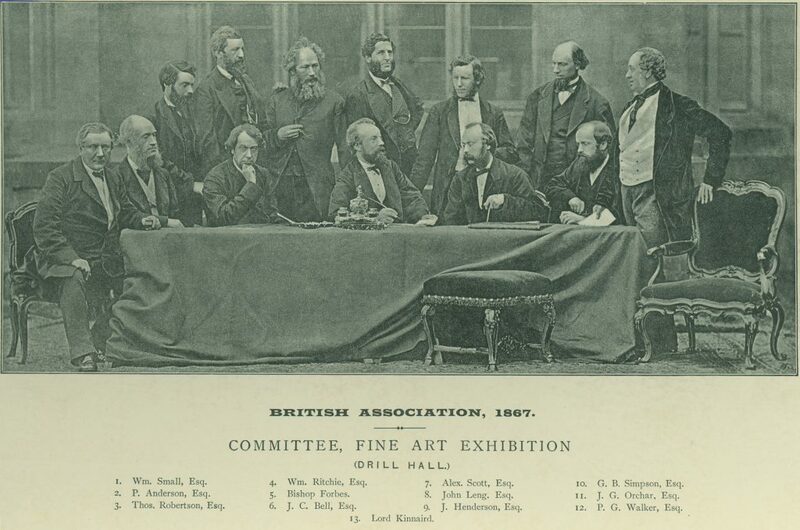 Committee member, Fine Art Exhibition (Drill Hall), British Association visit to Dundee, 1867. Committee member, Restoration of Old Steeple, 1870. Committee member, James Carmichael statue, 1872-1876. Director, Dundee Orphan Institution, 1875-1889. Director, Dundee Shipowners Company, c.1884-1887. Director, Western & Hawaiian Investment Company, c.1885-1902. Director, East of Scotland Investment Company, c.1885-1902. Convener of business committee, Dundee Fine Art Association, c.1893-1902. Subscriber no.18 – Edward Baxter – fellow member of Dundee Industrial Schools Society. Subscriber no.21 – J.C. Bell – fellow member of Fine Art Exhibition Committee, 1867. Subscriber no.29 – Sir David Baxter – fellow member of Dundee Industrial Schools Society. Subscriber no.35 – W.E. Baxter – fellow member of Dundee Industrial Schools Society. Subscriber no.174 – J.G. Orchar – fellow member of Fine Art Exhibition Committee, 1867. Subscriber no.205 – George B. Simpson – partner in the firm of Ritchie & Simpson and fellow member of Fine Art Exhibition Committee, 1867. Subscriber no.260 – Lord Kinnaird – fellow member of Fine Art Exhibition Committee, 1867 and Dundee Industrial Schools Society. Ward Street Mill, Ward Road, Dundee. Maxwelltown/Ann Street/Nelson Street, Dundee, c.1856-1865. Office, 32 Baltic Street, Dundee, c.1856-1857. Ward Street Mill, Ward Road, Dundee, c.1858-1881. Lower Pleasance Mill, 22 Milne's Wynd, Dundee, c. 1871-1879. William Ritchie was the son of William Ritchie and Barbara Dall. His father was described as a military man but the Howff burial records refer to his mother as the widow of Lieutenant William Ritchie, RN, when she died in 1845. It would appear that the young William secured a place in a prominent commercial house in London, remaining there for a number of years. His daughters, Elizabeth and Agnes, were both born at Mile End, Middlesex, although their mother, Grace, was a Dundonian like their father. In 1851, the family were at Shrubland Road, Shoreditch and William is described as a manufacturer of linen goods. William is believed to have learned the business at the Ward Street Mill of William Boyack but this may have been before going into manufacturing in London. There may also have been a connection between his father and Boyack, as both men were Dundee councillors in 1837. William entered into a manufacturing partnership with George B. Simpson about 1853, with premises in Hawkhill. They also acquired a factory in Maxwelltown, before also taking over the Ward Street Mill of William's former employer. In addition the firm occupied the Ward Mill, which was the address both men were given in the subscription to the Albert Institute. It is difficult to establish exactly which building this was, but it was probably located in South Ward Road. At this time, William lived in Westfield Place, south of Perth Road. Ritchie & Simpson were described as merchants and manufacturers by the time of the subscription to the Albert Institute. Both partners were listed as individual subscribers. The firm also subscribed a guinea on an annual basis to the Dundee Industrial Schools Society, 1862-1875. Its Ward Street Mill was very close to the Industrial School in Ward Road. William Ritchie became a director of the society in 1867. William put his "desirable west end residence" at 13 Westfield Place up for sale in 1864, so that he could buy a larger house presumably to help house his growing family and perhaps, just as importantly, his growing art collection. It was noted that at the 1867 Royal Scottish Academy exhibition in Edinburgh that many of the paintings belonged to Dundee merchants, with William Ritchie and his partner, George Simpson, among those mentioned. Ritchie & Simpson built up a large and lucrative business as merchants, flax and jute spinners and manufacturers. They acquired the Lower Pleasance Mill in addition to the Ward Street Mill. By 1871 they employed 600 people. 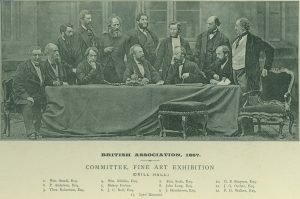 Both William and his partner, George Simpson, were keen art collectors and both served on the Fine Art Exhibition Committee for the visit of the British Association to Dundee in 1867. By this time William had purchased Elmslea, Perth Road, Dundee to house his growing collection. He also welcomed to his home some of the artists whose works he commissioned or purchased. William McTaggart and William Vallance were both in residence at the time of the 1871 census. In addition to his involvement as a director with the Dundee Industrial Schools Society, he also took on a similar role with the Dundee Orphan Institution. In 1866, William Ritchie and George Simpson were both in attendance at the presentation to Peter Begg, in recognition of his role in establishing the free library in Dundee. William was also present at the dinner marking the opening of the free library and art exhibition in 1873. He also played a crucial part in the project to have a statue of James Carmichael, the engineer, erected in Dundee. Along with that other noted art connoisseur, J.G. Orchar, he was delegated the responsibility for the work, choosing to commission John Hutchison, sculptor. William Ritchie died on 21 October 1902. He had been pre-deceased by his wife and left two sons and four daughters. Two of his daughters and two grandsons shared his Newport home with him in his last years. Old Parish Record. Dundee. Birth. 4 December 1818. FHL Film No. 993425. Ancestry website and Baptism. 30 December 1818. 282/100 303. ScotlandsPeople website. 1861 Census Scotland. Dundee second district. 282/2 ED13 p.31. Ancestry website. Dundee Courier, 6 June 1862. British Newspaper Archive website. 1871 Census Scotland. St. Peter, Dundee. 282/1 ED20 p.17. Ancestry website. 1851 Census England. Haggerstone, Tower Hamlets. HO107 Piece 1538 Folio 363 p.10. Ancestry website. Dundee Directories, 1867-1885. Local Studies, Central Library, Dundee. Dundee Directories, 1890-1902. Local Studies, Central Library, Dundee. Leng, John & Co. (1903) Dundee Year Book. Dundee: John Leng & Co. Local Studies, Central Library, Dundee and Statutory Registers. Forgan, Fife. Death. 21 October 1902. 431/41. ScotlandsPeople website. Dundee Courier, 11 October 1871 and 27 October 1902. British Newspaper Archive website. Dundee Courier, 3 October 1865. British Newspaper Archive website. Dundee Directories, 1867-1881. Local Studies, Central Library, Dundee and Annual Reports, Dundee Industrial Schools Society, 1862-1883. GD/AY 6/2/1 and 2. Dundee City Archives. Jarron, Matthew. (2015) "Independent & Individualist" - Art in Dundee 1867-1924. Dundee: Abertay Historical Society. University of Dundee Archive Services. Dundee Courier, 14 June 1870. British Newspaper Archive website. Dundee Courier, 18 July 1872 and 20 June 1876. British Newspaper Archive website. Dundee Directories, 1876-1889. Local Studies, Central Library, Dundee and Minute Book, Dundee Orphan Institution, 1875-1890. GD/AY 7/1/5. Dundee City Archives. Dundee Directories, 1885-1887 and Leng, John & Co. (1903) Dundee Year Book. Dundee: John Leng & Co. Local Studies, Central Library, Dundee and Dundee Courier, 24 October 1902. British Newspaper Archive website. Dundee Directories, 1885-1902. Local Studies, Central Library, Dundee. Dundee Directories, 1893-1902. Local Studies, Central Library, Dundee. Dundee Directories, 1861-1865. Local Studies, Central Library, Dundee. Leng, John & Co. (1903) Dundee Year Book. Dundee: John Leng & Co. Local Studies, Central Library, Dundee. Index to Howff Burial Ground. Barbara Dall. 3 April 1845. Friends of Dundee City Archives website. Watson, Mark. (1990) Jute & Flax Mills in Dundee. 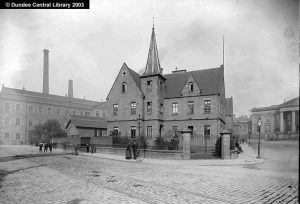 Tayport: Hutton Press Ltd. Dundee City Archives. Dundee Courier, 2 July 1864. British Newspaper Archive website. Dundee Courier, 18 February 1867. British Newspaper Archive website. Dundee Courier, 8 November 1866. British Newspaper Archive website. Dundee Courier, 30 November 1873. British Newspaper Archive website. Dundee Directories, 1878-1881. Local Studies, Central Library, Dundee. 1881 Census Scotland. St. Peter, Dundee. 282/1 ED30 p.15. Ancestry website. 1891 Census Scotland. Forgan, Fife. 431 ED4 p.5. Ancestry website. 1891 Census Scotland. Forgan, Fife. 431 ED4 p.5 and 1901 Census Scotland. Forgan, Fife. 431 ED5 p.8. Ancestry website. The ever-helpful staffs of Local Studies, Central Library, Dundee, Dundee City Archives and Archives, Local and Family History, A.K. Bell Library, Perth. The information above about William Ritchie has been collated from a range of digital and hard copy sources. To the best of our knowledge it is correct but if you are relying on any information from our website for the purpose of your own research we would advise you to follow up the sources to your own satisfaction. If you are aware of an inaccuracy in our text please do not hesitate to notify us through our Contact page.